The implementation of the Millennium Development Goals (MDGs) has been history’s single largest effort to coordinate and empower development at a global level. By establishing the goals in 2000, the international community made a formal commitment to collaborate and focus resources and experiences in order to eliminate extreme poverty worldwide. Huge progress has been made. The number of people living on less than $1.25 per day has halved since 1990, primary school enrolment is up to 90% at a global level, and gender parity has been achieved in primary school attendance. Over 2 billion people have gained access to clean drinking water over the last two decades, and maternal mortality has reduced by 47%. While these numbers are encouraging, regional differences are extremely varied and many targets are far from being met. With the MDG 2015 deadline rapidly approaching, efforts are being concentrated on the objectives that have not yet been reached and the global dialogue on the post 2015 development agenda is in full force. The future of international development must be sustainable in the long term, in every sense of the word. Communities must be empowered to carry on economic and social improvement long after development projects are over in order to ensure food security and social stability. Furthermore, developing countries need to avoid the pitfalls of fossil fuel-based economies if we are to have some hope of mitigating the effects of climate change. All Humana projects are based around these two principles. One of our most successful initiatives to help people out of extreme poverty in a sustainable way is aptly named Farmers Clubs. Seventy percent of people at risk of food insecurity live in rural areas throughout Africa, Asia, Latin America and the Near East. Although rural family farmers are essential to sustainable and environmentally friendly development, many do not have access to the natural resources, knowledge or technologies that could pull them out of poverty. However, growth from agriculture is at least twice as effective as any other form of development aid. As such, the Food and Agricultural Organisation of the United Nations (FAO) has named 2014 as the International Year of Family Farming, to encourage and equip small scale agriculture across the world. In line with this mission, Humana Farmers Clubs bring together groups of small scale farmers, training them in sustainable agricultural practices, as well as introducing them to renewable energy structures to enable access to energy and clean water. Over the course of three years, small groups of farmers are taught conservative and organic farming techniques, as well as literacy skills, local market knowledge and money management principles. Many farmers in the program more than double their crop growth, which is often accompanied by an increase in income through the sale of excess crops. Humana is currently supporting 9 Farmers Clubs across China, Zimbabwe and Malawi. 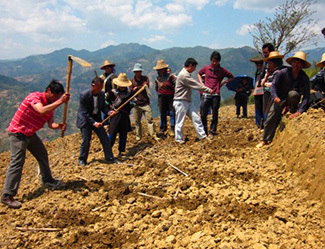 In the Yunnan province of China, the impact of the Farmers Club model can clearly be seen in the Yuanyang county project. 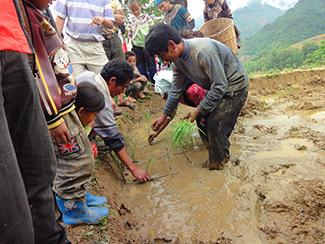 Over three years, a total of 50 Farmers Clubs were initiated, through which over 160 hectareas of sustainable rice and maize were planted, a cardamom cooperative was initiated for future income, 256 piglets were gifted to community members through a pass-on system, and a new preschool gave 192 children the opportunity to receive early childhood education for the first time in the village. Since the project officially ended at the end of last year, the local government has agreed to continue support of the preschool in light of its positive effects on the community, and the Farmers Clubs continue to thrive. Farmers Club methods are straightforward, holistic, and inclusive, with far reaching effects. Increased and diversified crop yields increase nutrition; the possibility to increase income can provide children with the opportunity to go to school; and improved water management not only helps maintain food security year round, but also increases health and hygiene standards. Dialogue surrounding the post 2015 agenda is currently focusing on how the world is going to meet the increasing needs for food security in light of the effects of climate change. Models such as the Farmers Club address both of these concerns in tangible and long-lasting ways. Often, the most effective techniques are not only simpler, cheaper and easier to maintain, they are also kindest to the earth.